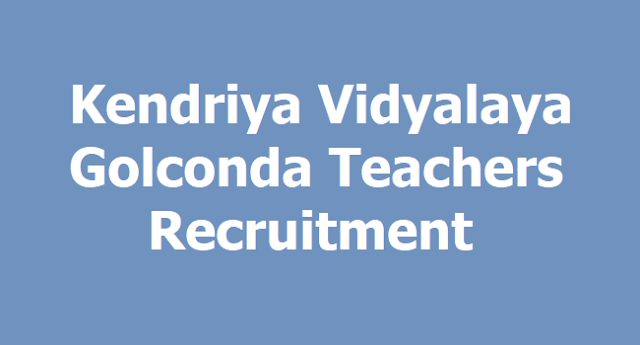 Kendriya Vidyalaya Golconda Teachers Recruitment 2019: Kendriya Vidyalaya Teaching Posts 2019: Kendriya Vidyalaya, Golconda Teaching Posts (Last date: 16.02.2019). Kendriya Vidyalaya Sangathan(KVS) is an autonomous organization under the Ministry of Human Resource Development, Government of India. Kendriya Vidyalaya,Golconda invites applications for the Teacher posts for the year 2019-2020 on purely part time contractual basis. KVS Golconda Recruitment 2019: Kendriya Vidyalaya, Golconda has released a notification regarding the recruitment for the posts of part-time teachers and other staff on a temporary basis for a maximum period of one year or till regular incumbent joins, on the official website- kv1golconda.edu.in. Interested and eligible candidates can apply for the positions before February 16, 2019. Applications are invited from eligible candidates for appointment of Part-Time Teachers purely on contractual basis against vacancies /likely vacancies at this Vidyalaya with consolidated pay for the academic year 2019-2020. KV is hiring for the posts of PGT (Hindi), TGT (English/ Hindi/ Science), Primary teachers, Dance teacher/ coach, Computer Operator, Games and Sports coach, Nurse, Counselor, PRT Music, Data Entry Operator and German teacher. Candidates should keep in mind that the computer knowledge along with proficiency in teaching in Hindi and English is essential for all the posts. a) For TGT (Hindi): Candidate should have studied Hindi in all the years of graduation with atleast 50% marks in Hindi and also 50% aggregate in Graduation. b) For TGT (English) : Candidate should have studied English in all the years of graduation with atleast 50% marks in English and also 50% aggregate in Graduation. (1) The candidate should have studied Botany, Zoology and Chemistry in all the years of graduation with atleast 50% marks in each subject. d) For TGT (Maths) - Bachelor Degree in Maths with any two of the following subjects: Physics, Chemistry, Electronics, Computer Science, Statistics. ii) Diploma in Education ( D. Ed) of duration of not less than two years. Bachelor of Elementary Education (B.EI. Ed.) . iii) Competence to teach through Hindi and English media. iv) The candidates having professional qualification B. Ed also eligible. 1.B.E. or B.Tech. (Computer Science / IT) from a recognized University or equivalent Degree or Diploma from an institution / university recognized by the Govt. of India. ‘C’Level from ‘DOEACC’Mini Communication Technology and Graduation. Degree / Diploma / Certificate (NIS) from recognize Institute and Professional competency in concerned field. Diploma in Nursing with valid registration. B.A./B.Sc. (Psychology) with Certificate of Diploma in Counseling. 1) Senior Secondary School Certificate with 50% marks or Intermediate with 50% marks or its equivalent and Bachelor Degree in Music or equivalent from a recognized University. i. Class XII pass or Equivalent from recognized board or University. ii. Typing speed of 35 w.p.m in English OR 30 w.p.m in Hindi on Computer. iii. Working knowledge of Hindi. “C” Certificate / Bachelor’s Degree or PG or Advance diploma in German Language from a recognized University. or till regular incumbent joins, whichever is earlier. 2. No TA/DA will be paid for attending the Screening Test / Interview. (http://www.kv1Golconda.org) and Register with relevant Photo copies from up to 16-02-2019 between 10 AM to 1 PM on all working days only . The eligible applicant’s list will be displayed on our Vidyalaya website and Notice Board on 22/02/2019 at 9.00 pm. following. For short listed Candidates Interview will be displayed... ( will be intimated by SMS/ Displayed on Web site). The candidates will be selected through short-listing followed by an interview. 2. Qualification: B. Ped Degree / Certificate (NIS) from recognize Institute and Professional competency in the concerned field. 1. Nature of Appointment:- On purely Part-time contractual Basis. Duration 1st April 2018 to 31st March 2019 (for one academic year)or whenever the regularincumbent joins whichever is earlier. 2. The application forms downloaded from the Vidyalaya website only must be used for registration. 3. Relaxation in CTET: In the absence of CTET qualified candidate, candidate without CTET qualification may be considered if otherwise eligible as per KVS recruitment rules. Candidates with special B.Ed qualification are not eligible for PGT post.Candidates with special B.Ed/B.Ed qualification are not eligible for PRT post. 4. Candidates are requested to read the eligibility criteria carefully and ensure their eligibility for the post before applying for the same. 5. Applications received after due date and also applications sent by e-mail will not be accepted. 6. All the original documents should be submitted by the candidates at the time of interview for verification only. 7. Computer knowledge is desirable for all the posts. 8. The candidate must have competency to teach both in English and Hindi media.